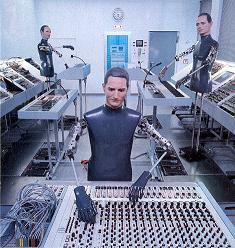 "Kraftwerk record their records and play their concerts with instruments that are built by themselves." How many times have you read/heard some version of the above quote over the years? In earlier times there were certainly items that Kraftwerk had built or modified for them, but most of Kraftwerk's records have been made with commercially available keyboards/synthesizers. In the 90s in particular, one can see quite easily within the racks of Kling Klang at concerts a multitude of familiar brand names. And the bands involvement with companies such Doepfer and Quasimidi also reveals what all they are currently using - similar equipment to what you yourself can purchase from commercial outlets. In the 1970's Kraftwerk did indeed use some electronic instruments that they, or their associated engineers, either constructed or modified from existing equipment. It is impossible to say to what extent such equipment was used, but Kraftwerk have also used mainstream electronic equipment as well as their own equipment from their earliest days right up to the present. However, despite the prevalent myth that continues to this day in the media, Kraftwerk's first two LPs were recorded using mainly conventional instrumentation, such as electric piano, organ, guitars, flutes, bass guitar, violin and the like. Even up until 1975 Ralf Hütter could still be seen using a Farfisa 'Professional Piano' electric piano in live concerts, a mainstay of their first LP ('Kraftwerk', 1970) in particular. The band added Moog Mini-Moog, ARP Odyssey, EMS-Synthi A, Moog Polymoog, Korg PS-3300, Sequential Circuits Prophet V synthesizers and other mainstream and readily available equipment throughout the seventies as they became available, just like their contemporaries. However, album credits do reveal exotically titled instrumentaion such as 'Rhythmusmaschine' and 'Synthanorma Sequenzer'. Interestingly, debate on the Kraftwerk Internet mailing list in December of 1998 highlighted the fact that there are some items that have been patented by Kraftwerk. Amongst these is the design for an 'Electronic percussion musical instrument', namely the electronic percussion pads seen from the bands mid-70s period. The patent lists the inventors as being Florian Schneider and Ralf Hütter, the dates listed as June 14, 1977 / July 10, 1975. Interestingly, the patent seems to only cover the 'look' of the equipment, not the actual sound creating electronics and the like. Certainly the accompaying diagrams which can be viewed show only the casing for the device. The patent, USD0244717, is viewable at the IBM Intellectual Property Network site, the specific URL currently being http://www.patents.ibm.com/details?pn=USD0244717__〈uage=en. Extracts from Kraftwerk's patent for the design of the electronic percussion pads. The more recent patent is for a 'System for and method of synthesizing singing in real time', the inventors being listed as Florian Schneider, Gert Joachim Ott and Gert Jalass, patent number EP396141A2. Looking at the inner sleeve of 1991's 'The Mix', one can notice the name of Ott namechecked under the 'hardware' section (seemingly), while 'Jalass' come under the banner of software. The dates listed on the patent this time are Nov. 7, 1990 / May. 3, 1990. The patent for this item is somewhat more substantial in its technical detail. It makes no mention of the word 'Robovox' anywhere, but it's possible that this may be part of that equipment that Florian has used as part of the Kraftwerk setup. The patent, http://patent.womplex.ibm.com/details?pn=EP00396141A2. Quite what the significance of these items may in actual fact be is of course a moot point since Kraftwerk are loathe to discuss such matters in anything approaching fine detail. Before the age of samplers, to recreate 'real' sounds a keyboard called the Mellotron was the most popular choice for recreating string and orchestral sounds by many acts, from the late 60s (such as The Beatles) right through the 70s (perhaps most famously by King Crimson) even into the 80s (Orchestral Manouevres in the Dark being particular fans). It's even on the loose in the 90s, with acts such as Radiohead making much use of it on their 'Ok Computer' release. By 'Radio-Activity' (and most famously 'Trans-Europe Express') similar string and orchestral tones were added to the Kling Klang arsenal - however, it appears that these sounds emanate not from a Mellotron but an instrument by the name of the Vako Orchestron. By the 80s and the advent of the sampling age it is rumoured that the band had purchased a CMI Fairlight, which supposedly broke down when the band disassembled it into a rack-mounted version(!) - how accurate this is is a little unclear however. It is however very well documented that by the mid-80s the band had moved on to the more advanced Synclavier synthesizer, some of its presets are clearly audible on 'Electric Cafe' (something of an anomaly for a band so fastidious in creating their own unique sounds previously, to rely on presets?). For what it's worth, both the CMI Fairlight and NED Syncalvier were extremely expensive bits of kit. If you're familiar with Jean Michel Jarre's 'Magnetic Fields' LP you can see pictures of the Fairlight's monitor screen on the original inner cover. Other early exponents of the Fairlight were Peter Gabriel and Kate Bush, amongst others. The bands 1991 tours revealed many well known brand names nestled amongst the Kling-Klang equipment, including Midi-Moog keyboards, AKAI samplers, a Waldorf Microwave and the like. More recently, the band have been name-checked in the more technical-oriented music press as having been involved in the development of some new equipment (summarised in the Vorsprung dürch Technik?! article from Aktivität 6); Doepfer MAQ16/3 Analog-MIDI Sequencer, the Doepfer MOGLI Midi-Glove (MOGLI = MIDI Operated Glove Interface), the Quasimidi QUASAR sound module and in early 1996 Florian Schneider reviewed the Doepfer A-100 module for a German magazine and provided a demo of its vocoder capabilities in the magazines accompanying free CD - he was involved to some extent in the development of the instrumentation, though primarily in the realm of providing feedback rather than a 'hands-on' development role (See the article 'Activity - In Depth: The Doepfer A-100 Modular System' from Aktivität 8 for further information). 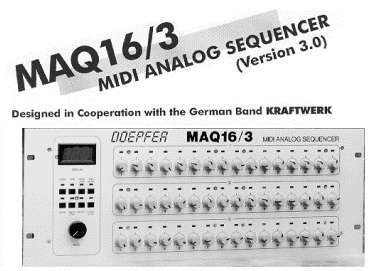 Publicity sheet for the Dopefer MAQ 16/3 sequencer. The Schaltwerk electronic percussion module from Doepfer has also been incorporated into the Kling Klang set and could be seen at the bands 1997 concerts, along with the custom-made MMK2 mini-keyboard. Whether the Schaltwerk module had any Kraftwerk input at all in its design is unknown. This device is amongst the items listed in the credits for 'Kraftwerk 2'. An electronic percussion unit (possibly identfied as being an Echolette 'Drummer One' electronic percussion device) modified, seemingly, by Florian Schneider, from an existing home-organ rhythm unit. It can be heard clearly on 'Kling Klang', 'Tanz Musik' etc. Whether it was actually modified much is debatable, since the rhythms heard of the above tracks are standard pre-programmed patterns; later modified (or totally redesigned?) to be played using metal batons. This quote from Ralf Hütter in 'Electronics and Music Maker', September 1981, explains; "In 1971 Kraftwerk was still without a drummer, so I bought a cheap drum machine giving some preset dance rhythms. By changing the basic sounds with tape echo and filtering we made the rhythm tracks for our second album... Commercial synthesizers came fairly late into Germany and it was not until the third album that we started to use them. By that time, Wolfgang Flür had joined us to play a custom built drum system...". Debuted on some of Kraftwerk's 1976 concerts, this rig-up of equipment enabled a Kraftwerk member (Wolfgang Flür primarily but also Karl Bartos) to stand alongside it and trigger electronic percussion sounds (snare drum, bass drum and cymbal) by using hand movements to break light beams. The unit was apparently problematic for live use and was never again used live after the 1976 concerts. "We had been working with several other people on a modified pickup for flutes, but it was with the percussion that we first began to get good results. Through the use of photo-electric beams we set up a circuit which would operate a selection of cassette tapes when the beam was broken. By synchronising the rhythm on tape with the rhythm of a drummer's hand , say, an almost infinite variety of syncopations can be produced simply each time the drummer strikes a beat on his conventional drum-kit. We patented this idea some time ago..."
The same interview also credits an 'electronic vibraphone' as having been another item made by the group. This could be seen behind Florian's position in he 1991-93 stage set. This may well be the equipment built for the band in conjunction with a gentleman by the name of Falk Kuebler, or may be the device that the patent detailed earlier in this article is for. Obviously it is (at least) one of the devices used by the band for generating the robotic voices as heard on their records. It is possible that this is a device modified from an existing computer by Florian and one of the bands back-room technicians, which has been referred to in the past. In terms of Vocoders, Florian is reputed to have built up quite a collection of these It is known that the 1981 Kling Klang set included both Sennheiser and EMS models. Credited on the sleeve for 'Trans-Europe Express', this appears to be some kind of is a sequencer developed by/for the band by/with Matten and Wiechers of Bonn. Not a lot is known about it I'm afraid. It is a customized 32-step 16-channel analogue sequencer. 1981s 'E&MM' article refers to 'two analogue sequencers which will produce up to 64 notes. The many rows of switches have 'in', 'shift' and 'stop' settings for trigger, rest and reset points, as well as pitch control. The sequence can run as two x 32 in parallel or 1 x 64 in series'. This may well be the Synthanorma Sequenzer. The article also makes mention of the bands use of an expanded-memory Roland MC-8 Microcomposer, which Ralf remarks as being "much easier to use than the analogue sequencers". A view not shared by Karl Bartos, it seems, who is quoted as remarking in the March 1998 issue of 'Sound on Sound' magazine the following; "It was crap! We never used it on any recordings and wasted a hell of a lot of time on it, actually. Instead, we used custom-built, very big, analogue-style sequencers with 32-steps". The 1981 E&MM interview with Ralf Hütter once again; "...Karl's keyboard - specially made in Italy to replace Korg's keyboard controller, which operates the Korg PS-3300 polyphonic synthesizer". Not a lot of detail on this, but colour pictures reveal that within its shiny metal casing there are LEDs which show the keys which are being played at the time! This is in fact not a Kraftwerk invention, it appears. The 1981 E&MM interview describes the following as part of the bands instruments; '... a special light-disc instrument from Florida for mono-choir sounds...'. From the same unidentified 1976 interview as earlier quoted, the text also notes; 'Besides their photo-electric percussion equipment, they have made an electronic vibraphone and keyboards, and through full use of cassette tapes, have perfected a light-disc organ which plays an impressive set of melodies and rhythms in programmed sequence.' This latter quote gives the impression that this instrument is one of Kraftwerk's inventions - however, this instrument has actually been identified as being a Vako Orchestron keyboard, so it is not in fact a Kraftwerk-made device. Similar in nature to a Mellotron keyboard, in that it uses samples of pre-recorded real instruments (for this device, on plastic optical discs, whereas Mellotrons use tape). First seen on the inner sleeve of the 'Radio-Activity' LP, and in concert in 1981, another Kraftwerk original. It would appear to be a controller to trigger external synthesizer equipment, not a sound source in itself. Ralf from the 1981 'E&MM' interview once more... "It's not actually blown but uses keys situated in flute-pad positions that are 'touched' by the fingers to give a D/A control voltage/trigger output for any of the synthesizers." Amongst the source material used in the preparation of this article are articles mailed to the unofficial Kraftwerk Internet mailing list by the following individuals over the years, whom I acknowledge here; Andrew C. Crowell, Rick Jansen, ManMachn2@aol.com. Most of the information is gleaned from the very useful article from the September 1981 issue of the UK 'Electronics and Music Maker' magazine, by Mark Beecher and from the interview with Karl Bartos in the March 1998 issue of 'Sound on Sound 'magazine.